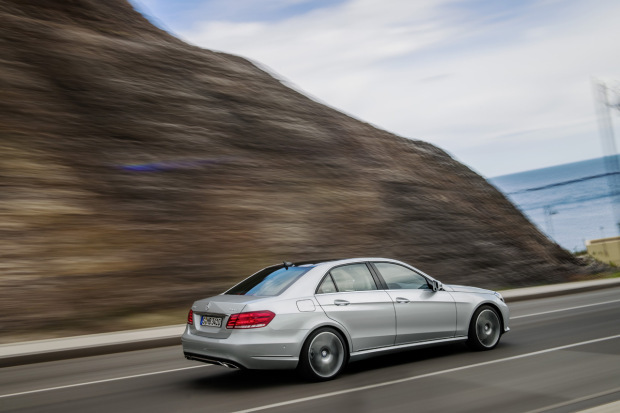 Luxury car giant Mercedes-Benz has launched the 2014 E-Class in India. The new E-class (codename W212) gets a refreshed design with this mid-cycle facelift and has gone back to a single headlight unit for the first time in 18 years. The headlamp is now encased in a single flowing lens with LED elements for the low beam and daytime running lamp.Mercedes will also be offering the E-class with the option of full LED headlamps. Other changes include a bigger, more aggressive grille flowing into a restyled bumper devoid of fog lamps. The rear sports new taillights and a new bumper as well. Inside, you’ll find a new sportier steering wheel as well as minor updates to the central console. The dials are new, the COMAND system gets a new screen and Merc is bringing in a sat-nav and a DVD player as well. The E-class will be offered in India with a choice of two engines – a 2.0-litre, direct injected petrol unit making 184bhp and a 2.1-litre diesel mill putting out 204bhp. Both are four-cylinder engines and will be mated to Merc’s 7G-tronic automatic transmission. Slightly surprisingly, Mercedes Benz has done away with the cheaper Classic and Elegance variants for the E-class. Both versions are available only in the top-spec Avantgarde trim, unlike its predecessors. Additionally, the German manufacturer has also introduced a ‘launch edition’ spec of the E 250 CDI, of which only 100 units will be sold. The launch edition E 250 CDI gets a panoramic sunroof, rear tyres that are larger than the front (245/40 R18 (F), 265/35 R18 (R)), a space saver and Merc’s illuminated central star.